Bön, Bonpo or Bon-po is the original pre-Buddhist religion and culture of Tibet. It has survived in Nepal in the Dolpo region up to the present days. Scholars consider Dolpo to be the last resource of the original (animistic) Tibetan tradition preserved in the world where we can see the proto pre-Buddhist Tibetan culture, which Buddhists suppressed in other areas of the Himalayas (Tibet). The founder of Bonpo (Yungdrung Bön) is Tonpa Shenrab mibo, who was born in the ancient kingdom of Zhang Zhung. Dolpo, too, was part of this kingdom. Bonpo followers believe that their founder, Tonpa Shenrab mibo - an enlightened master like Buddha, came to Tibet from Shambala (Tagzig Olmo Lung Ring) some 18,000 years ago. 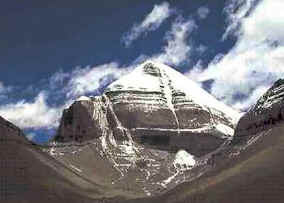 Adherents of Bonpo also believe that Tonpa Shenrab mibo had a strong influence on Hinduism, as the Zhang Zhung kingdom was centered around the Mount Kailash, the Lord Shiva's mountain. Bonpo (Yungdrung Bön) is different from Buddhism. It consists of "nine Bonpo ways" or "thegpa gu". The religion believes in karma and reincarnation like Buddhism, but instead of the Buddha's Four Noble Truths the emphasis is put on thegpa gu. Yum Chen Sherab Chamma is the Goddess of Bonpo and Shenlha Wodkar is her counterpart. 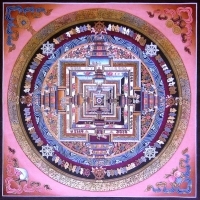 Bonpo has three basic forms - 1) the prehistoric shamanistic-like form, 2) Yungdrung Bön - the svastika dharma, or the ancient but perfectly elaborated teaching system that brings devotees to Total Completeness or Dzogchen, and 3) its modern form which drew many of its teachings from Buddhism. Many scholars consider this third Bonpo school to be nothing else than just an other form of the Tibetan Buddhism. Yungdrung Bön has its lamas, its teachings, its literature, and it also has found its way to other countries. In Yungdrung Bön, the Buddhas are not the Buddhist ones. The name "Buddha" simply implies that a person titled thus was enlightened. However, in the modern Bonpo school, which is part of the Tibetan Buddhism, the Yungdrung Bon Buddhas are considered to be the previous enlightened forms of the Buddha. Buddhists believe that before Buddha first appeared as Gautama Buddha in about the year 563 BCE, he had already manifested himself several times before. The culture of Zhang Zhung, Shang Shung, or Xang Xung had its center near the Mount Kailash and it extended to the present near-Kashmir area in India (Ladak). Its capitol was Kyunglung, the silver Garuda. In about the year 800 AD, the kingdom fell apart. Buddhism arrived to Tibet around the 7th century after Christ. The Buddhists destroyed much of the Bonpo culture in Tibet. They also persecuted followers of the Bonpo religion. This is probably an answer that no religion is a cure. The cure is, however, "not doing things that make you a Buddhist, Hindu or Bon, but that make you the best in everything you choose to do". The Zhang Zhung King Ligmincha was murdered by the Buddhist King Trisong Detsen. Trisong Detsen, the murderer, is considered to be (in Buddhism) one of the Three Kings of Dharma.